Easy Sloppy Joes Recipe with Beef And Beans is an easy meal that helps stretch your budget without sacrificing delicious taste. Plus, this Sloppy Joes recipe is GAPS legal! It’s summer. As a result, it’s time for summer food! Our weather has been crazy here in west Texas and from the weather reports, it has been for many of you too! One day it is freezing with sleet and snow. The next day it is sunny and warm. Hence, shorts weather! It’s confusing. You don’t change out of the jammies without first checking the weather forecast for the day! But it can also be challenging for the menu plan! Rather than assuming that everyone will want summery food, we need something that can be versatile. To me, it’s sandwiches, salads, hard-boiled eggs, and lots of other foods designed to be nourishing while not heating the house. Because it’s summer and your body is working harder to keep cool, summer foods seem to be consistently full of protein. Hence lots of meat and eggs! Probably this explains why winter foods are frequently full of carbs—our bodies are trying to store fat to keep us warm. Seems like why we crave those foods. Doesn’t it? What do you cook when the weather isn’t consistent? Working outside all day, no one wants a hot bowl of soup with temperatures in the high 70’s and above. Since they know I don’t make too many custom orders, they’ll eat it. But when the people are hot, a cooler meal is more refreshing. On the flip side, when the temperatures are barely in the 40’s, no one wants a cool salad meal. Instead, a hot bowl of soup hits the spot! 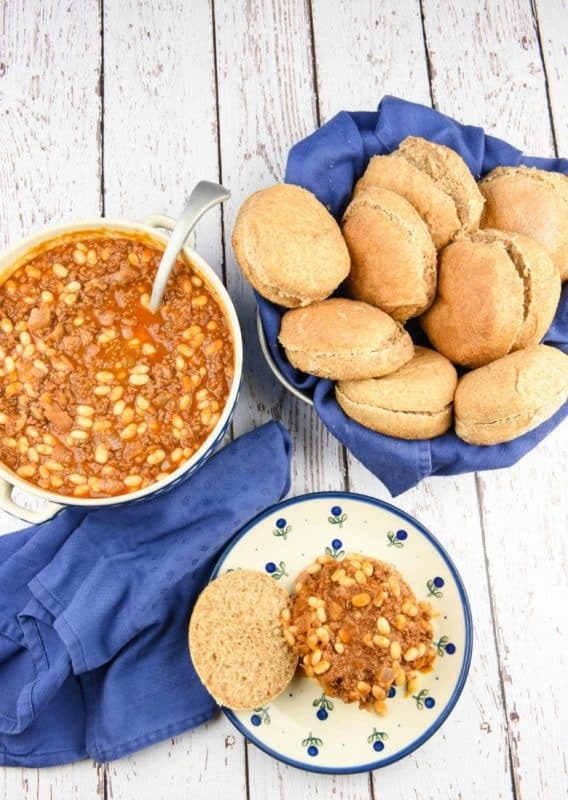 As a result, I have found a meal that works for both temperature extremes – Easy Sloppy Joes Recipe with Beef and Beans! I don’t know about you but I am always looking for economical yet nutritious meals. With a large family, every little bit helps when it comes to the budget. Plus, beans give a different nutritional profile that adds to the overall nutrition of the dish. Plus there’s some extra fiber thrown in! Normally, I would use kidney beans in this recipe. So, feel free to use what you have. I used white beans in these because they are GAPS legal. Since I have gone back to a GAPS type diet to encourage increased bone density (a diet taken from “Cure Tooth Decay“), I had to rethink this Easy Sloppy Joes recipe. White beans are really legumes so they are GAPS legal! While everyone else was enjoying Easy Sloppy Joes on homemade sourdough buns, I enjoyed a bowl of hearty Beef and Beans Sloppy Joe filling! If I have planned ahead, I like coconut flour biscuits that are GAPS legal – I just didn’t plan ahead this time! For the buns, I make a batch of Sourdough Bread Bowl Dough and shape into buns rather than bread bowls or I do the same with my Whole Wheat Bread recipe and make buns rather than loaves. Because variance among wholesome meat sources exists, select your beef sources mindfully. We are still enjoying plenty of hamburger meat from butchering our own steer, Brisket. But if you do not have the luxury of raising your own beef and are looking for locally raised grass fed meats, the Weston A. Price Foundation can help. If local meat is not an option, I have used and still recommend my affiliate partner, US Wellness Meats. Because they’ve served us so well in the past, I have no problems passing them on to all of you. They now have highly nutritious snacks too. If you’ve tried this Easy Sloppy Joes Recipe or any other recipe on Cultured Palate please take a minute to rate the recipe and leave a comment letting me know how you liked it. I love hearing from you! You can also FOLLOW ME on PINTEREST, FACEBOOK, INSTAGRAM, YouTube and TWITTER. Have you added beans to your sloppy joe? It helps stretch your meat. Soak the beans overnight covered in water and 1 Tbsp vinegar. In the morning, drain beans, cover with fresh water and cook until tender. Saute onions in butter or olive oil. Crock Pot Method: Once the beef is ground, add all ingredients into the crock pot. Cook on High for 4 hours or Low for 6 - 8 hours. What’s your favorite summer food? Do you like an easy Sloppy Joes recipe with or without beans? Tell us all about it in the comments! I just did GAPS Intro in Jan, love the results. This recipe looks fantastic! 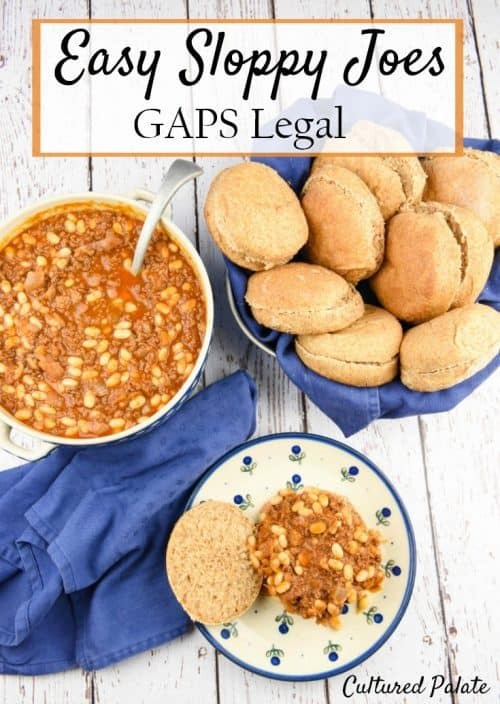 I didn’t even realize beans were GAPS legal, good to know! Rama, not all beans are GAPS legal but white beans are! I totally add beans to my sloppys to make the meat stretch 🙂 It tastes every bit as good and adds other nutrients! Beautiful photos! I need to try the white beans. We’ve been in and out of GAPS for many years – definitely need to try this! Andrea, my children love them! I love Sloppy Joes, sounds like a great recipe! I’m going to have to try this before the weather warms up completely. It looks just delish! Yum! I miss sloppy joes. These look pretty easy to make nightshade-free and the beans are a great idea. I’m on GAPS right now, so I’ll be trying this when I test beans! This looks amazing!! SO yummy, and like you said, great in all weather! A great GAPS option. Pinned. I love the idea of bulking out the beef with beans, so healthy and delicious!